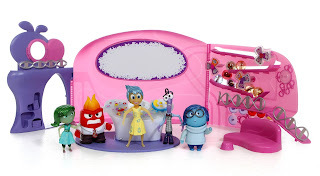 From TOMY toys, here were have this super cool Inside Out Headquarters playset! This was released last summer as part of TOMY's Inside Out "core figure" collection which also includes: the "core" emotion action figures (of course), the console playset as well as the musical Bing Bong figure. This playset seamlessly helps you bring all those elements together for imaginative play. 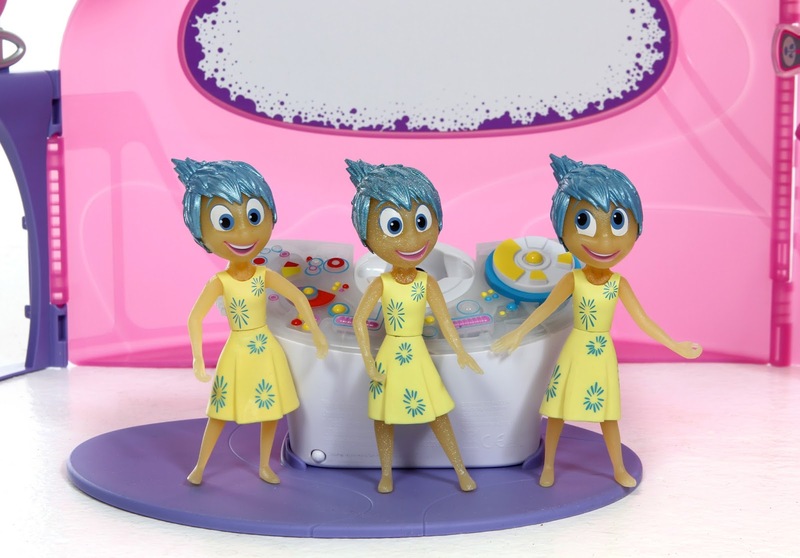 Combine them all to recreate your favorite scenes from the film or your own adventures inside Riley's mind! 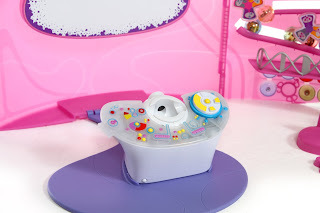 First let's take a look at the contents of this playset and its different features; then we'll see the real magic happen when we add the rest of the collection to the mix. Here it is all set up (takes about 10 minutes or so). 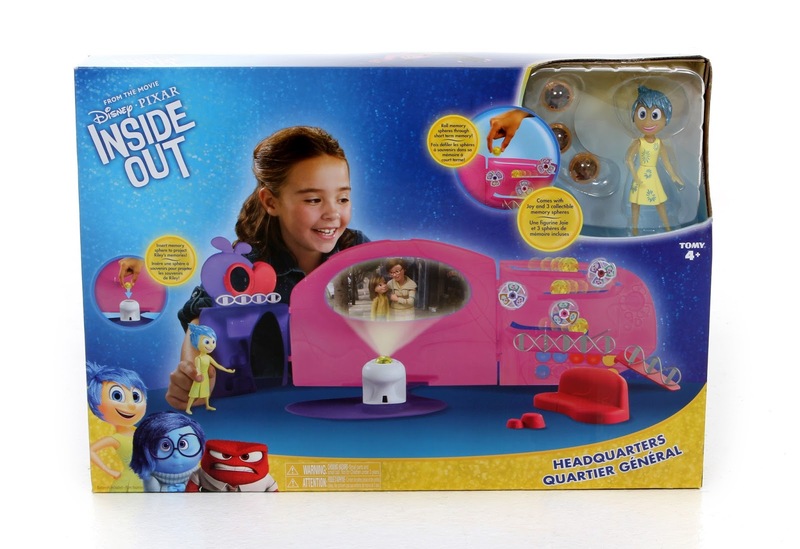 Inside the box you find the main playset components, a projector, a couch/stool, three joy "memory spheres" and an exclusive glitter Joy figure (more on the difference between her and other Joy figures later in the post). While I do wish they went for a more purple color scheme (like in the movie), everything else looks great. I really like the overall design and little details. And yes, this is geared more towards girls- but I can't help but enjoy it! I'm such a sucker for playsets and display pieces in general. 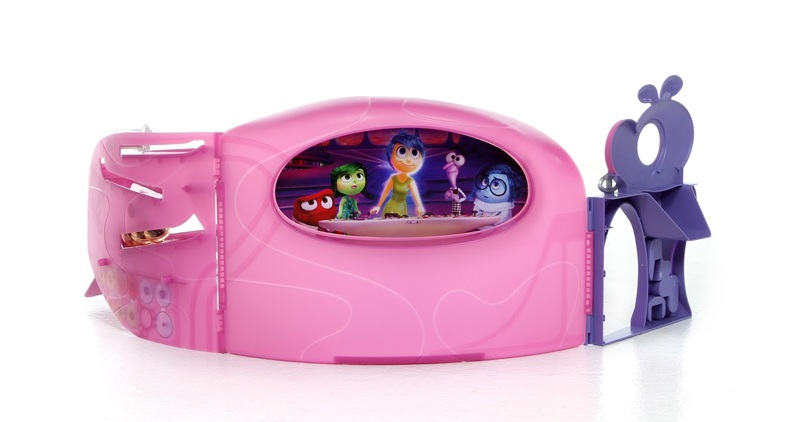 There are two main features with this playset. The first is the "short term memory" area. 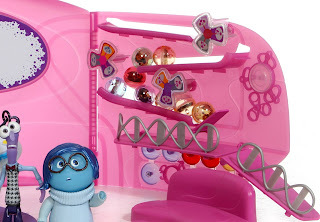 Drop the "memory spheres" onto the chute and watch them roll down while passing by the spinners! Lift the ramp to store the memories; drop the ramp to send them off to long term. The second feature is memory projection! Place any memory into the top of the projector (it takes some adjusting to get it just right), turn off the lights and see Riley's memory up on the screen. Many people were disappointed by how well this feature actually works (since the projection image is not as clear as the packaging suggests), but I knew exactly what I was getting going into this. I actually had a lot of fun with it! See all the features in my YouTube video at the end of this post. 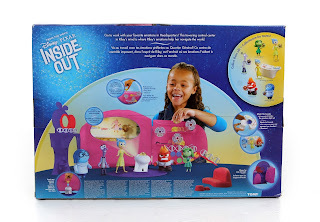 Here is the back of the playset as well as how to fold it up for easy storage. When folded, it doesn't take up much space at all. Now let's put in the console accessory (sold separately, see full post HERE). This gives Headquarters a more complete look! 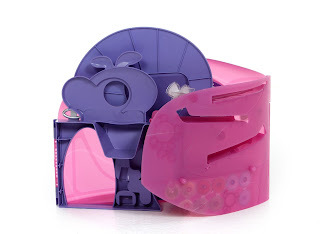 As seen below, the projector included with this playset connects to the console. Also, when the figures are placed near the console, they magically light up! 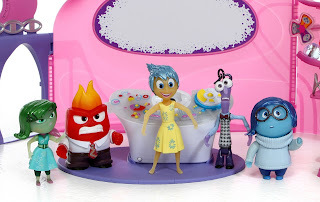 Let's go ahead and add all the emotion figures and their included memory spheres. This was the moment when I was like "ok, this playset is so cool." They look so great displayed there in Headquarters! 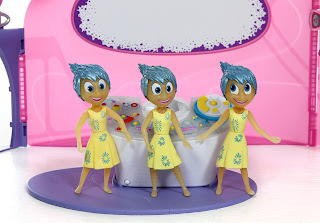 As mentioned, here's a comparison pic of the three different Joy figures that are out there. The one on the left is standard single pack release. The one in the middle (with the most sparkles/glitter) is the one that comes with this playset. The one on the right is the one that comes with the console. 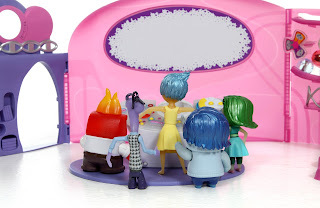 Another note is that I had heard (before opening them) that the figures didn't stand up well. I was so happy to see that that wasn't the case (at least for me). They all stood up perfectly fine on their own without the use of stands! Now I finally get to show you what I've been working on over the weekend...my Headquarters playset video where you can see everything talked about above in action! Enjoy- and feel free to like and subscribe. Thanks so much for visiting and be sure to check back daily for more from my Disney·Pixar collection of merch and memories!